State Center is a major State employment center with the largest concentration of State agencies in Maryland employing over 3,000 people. It is the bridge between Midtown and West Baltimore in the heart of the Cultural Arts District and sits adjacent to University of Baltimore and the Maryland Institute College of Art. It is one of the most transit-rich sites in the State with the metro, light rail, buses, and Amtrak a short walk away. Unfortunately, State Center is also an isolated fortress of asphalt and obsolete buildings that divides and weakens the surrounding nine neighborhoods. The redevelopment project would enrich and unite these communities providing state of the art facilities, amenities and economic opportunity. State Center will be created “for the people, by the people,” in a transparent, all inclusive format called CityScaping. This process includes regular input from a citizen-led neighborhood alliance that provides a conduit for area residents, employees, businesses and other stakeholders to participate and share their voice to impact project planning as it happens. The current surface parking lot on the Southwest corner of Eutaw and MLK will be 500,000 square feet of new mixed-use buildings consisting of ground level retail, private office space and the Departments of Health and Mental Hygiene and Information Technology. This structure will be built atop a State-owned public underground garage. The courtyard space at the southwest corner of Preston and Howard streets will have a new 150,000 square foot building with ground level retail and 2 State agencies including the Maryland Transit Administration (MTA) and Maryland Department of Planning. These civic gateway buildings will redefine State Center and the adjacent Baltimore neighborhoods and begin to introduce new retail and residential to the current desolate landscape. These two buildings will be designed to optimize daylight and access to views while utilizing progressive green roof technology and bioswale design that will provide a healthy watershed and reduce heat island effect. 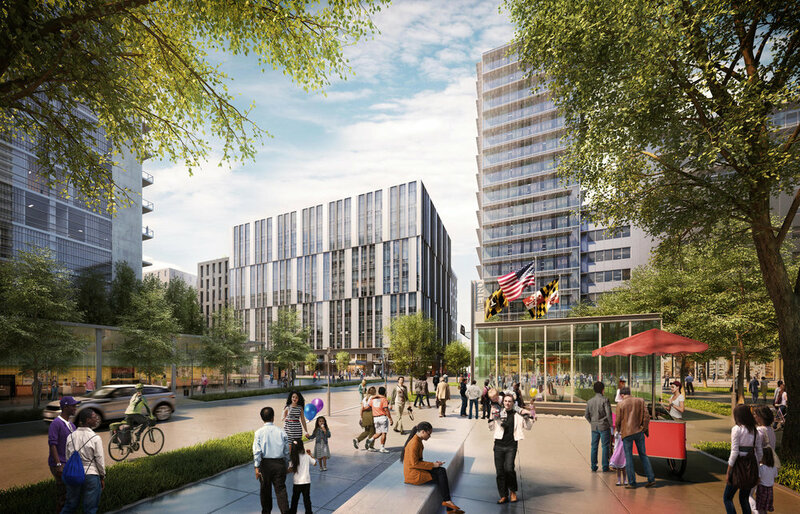 Street life will come alive with ground level retail, dynamic sidewalks and narrowed street widths with easily passable crosswalks to knit State Center into its surrounding communities. One of the landmark amenities of the State Center, Phase I plan, is to repurpose the historic State-Center Armory as a mixed-use retail and office/residential space. Most notably, the Armory will include a 91,000sf grocery store.